Its description is dry, although very open: “a creative platform dedicated to people who are united by a desire to express themselves“. Marsèlleria Permanent Exhibition is an environment that is not related to any particular expressive form, but is compatible with a wide variety of creative expressions. Marsèlleria opens Tuesday, December 1, with Flying False Colors, a solo exhibition by Carlo Zanni. The works on display in Italy will come directly from the exhibition at the Chelsea Art Museum and from the Perfoma09 Biennial of New Visual Art Performance in New York. Flying False Colors (The Sixth Day) is a multiplatform project that unravels and reveals the link between oil consumption, politics and environmental problems in the 30 countries supervised by the Joint Oil Data Initiative, an institution founded in 2001 to estimate how much oil is requested each month by the main consumers of black gold worldwide. 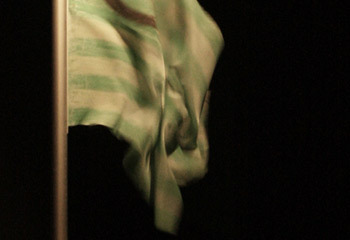 In the silence of the Marsèlleria Permanent Exhibition, the rustle of a flag connected to a compressor modulated by a computer provides the troubling visual and audio transposition of the continuous impoverishment of the world’s oil resources. The wind is programmed to blow the flag at a specific speed and in a specific direction for a period of time in correlation to the number of barrels of oil requested by a given nation and the weather in that country’s capital. When, for example, the flag waves southward for 14 seconds, it could refer to the demand for oil and weather conditions in Italy, while when it blows towards the northeast for 72 seconds it could represent China. Flying False Colors (The Sixth Day) is freely inspired by The Three Days of the Condor (1975) directed by Sydney Pollack, one of the first spy films to suggest any connection between the military secrets of the United States and control over oil production in the Middle East. The design of the flag is derived directly from the Ecology Flag created in 1969; during the exhibition the flag’s colors will gradually molt, illustrating the concept of “flying false colors”, meaning flying a false flag to mislead the enemy. And from Performa09 in Milan hails the project The Fifth Day (2009): for this piece Zanni programmed an algorithm to link color photographs he took during a taxi ride in Alexandria to data that the artist found concerning the literacy rate and corruption in Egypt, together with other barometers of civic well-being, in order to create a “portrait” of the Middle East based on both objective and subjective data. The project is accessible online as a sequence of photographs in which the invisible data transform the images themselves ( http://www.zanni.org ). Carlo Zanni was born in La Spezia in 1975. He has been active internationally since 2001. He has exhibited in many museums and galleries including: Hammer Museum, Los Angeles (2009); Tent, Rotterdam (2009); MAXXI Museum, Rome (2007, 2006); New Museum, New York (2005); Gavin Brown’s Enterprise at Passerby, New York (2005); Chelsea Art Museum, New York (2009, 2004); CCA Glasgow (2003); P.S.1 Contemporary Art Center, New York (2001). ICA – Institute of Contemporary Arts in London hosted his first retrospective in October 2005 and published the book “Vitalogy”. He participated in PERFORMA 09 and he is currently showing at Lorcan O’Neill Gallery, Rome.